Our two Air Asia flights went smoothly. The short 4-hour layover in Malaysia's Kuala Lumpur Airport was a treat. Immediately after clearing customs we enjoyed a variety of intriguing stuffed pastries. We found an Uberpool for $5 into the city. An hour later we arrived at our near-impossible-to-locate hotel. The name of the hotel we booked was different than the name of the actual hotel. Without the help of our taxi driver and the other guy in our cab we wouldn't have found it. During our ride the other passenger, a local, gave us advice about where to visit. We went out for a well deserved beer after our day of travel. On the walk to the beer garden I filled up on street food, for 5,999 IINR ($0.40)! We passed a few 7/11's and Sylvie was ecstatic. They are a popular chain here and serve traditional american snacks as well as some things unique to Indonesia like green tea kitkat bars, tempeh chips and flavored soy milk. While at the beer garden we sat across from two Kiwis. They are contract pilots and work in Indonesia a few month a year. On the walk back to the hotel I stopped at a local dinner to pick up some more food. There were grilled chicken organs, feet, heads, and salted fish-just to name a few of the prepared dished. I bought some to go. The people working at the roadside restaurant were so shocked to see white people that they asked for our pictures. We spent our only day in Jakarta exploring local markets. From our hotel we walked to the Pasar Baru market. We immediately remarked how clean and quiet the streets were- we are still used to the honking and pollution of India. As we walked, not a single street vendor pestered us and not one rickshaw driver yelled at us. The food at the Pasar Baru market was a shock to our senses. We tried a bunch of snacks from several stalls. The desserts caught our attention- they're so different than anything we are familiar with. Many of the deserts have a sticky, doughy, gelatinous taste. 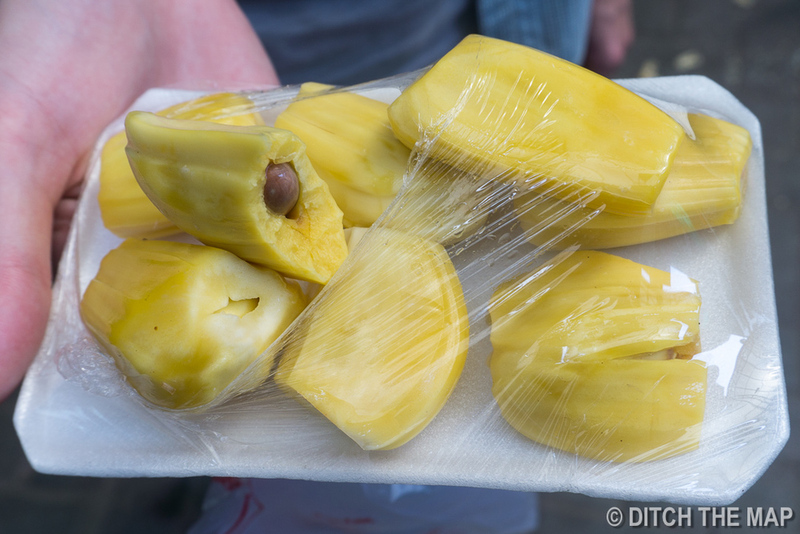 We bought some jack fruit to try. It's quite a convenient snack- each bite is in its own portable pod and its not sticky or wet, you just need to watch out for the huge seed. We tried a sate skewer, a sesame ball, a flaky pastry reminiscent of an Indian dosa but with a sweet green dollop of something in the middle and few other unique treats. 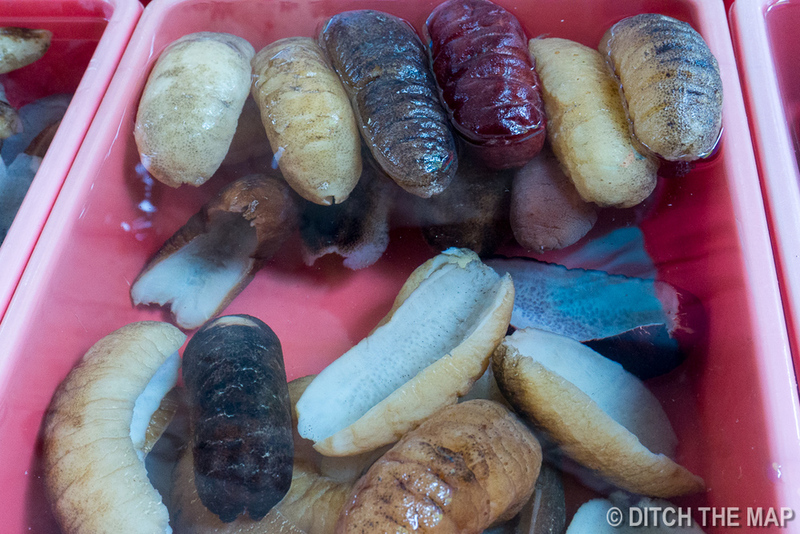 Thankfully we'll have plenty of time in Indonesia to try all of these delightful foods! 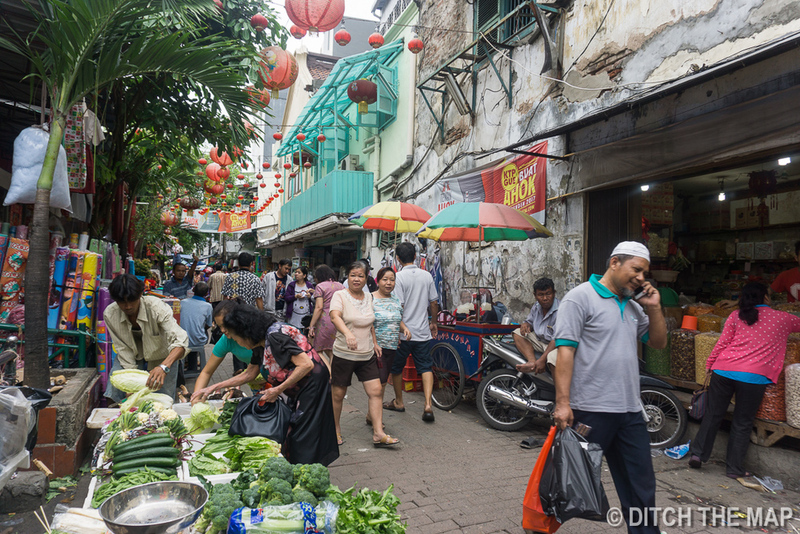 From the Pasar Baroe market we took a rickshaw to Glodok, (China Town) to check out the Chinese market. There was immense diversity in the selection of products. There were bootlegged DVD shops, stalls of exotic fruits, bunnies for sale, turtles for sale, bao buns for sale, birds in cages and skinned frogs legs. Of course we had to split a bao bun, and it was delicious! We also bought a dragon fruit for less than $1. We eventually found ourselves at the busy Jin De Yuan Temple. The sight was memorizing. Dozens of people walked about with incense and candles, some were releasing birds into the air, hungry cats lurked near by waiting for the disoriented birds, one young girl played with a bird on a string, parents stood next to their children teaching them how to hold the incense properly. We took in the sights fascinated by the going-ons. During our stay in India we grew accustomed to the lifestyle there more or less. It's exciting to be confronted with new things that we aren't familiar with and don't quite understand yet. Indonesia is sure to be an adventure. 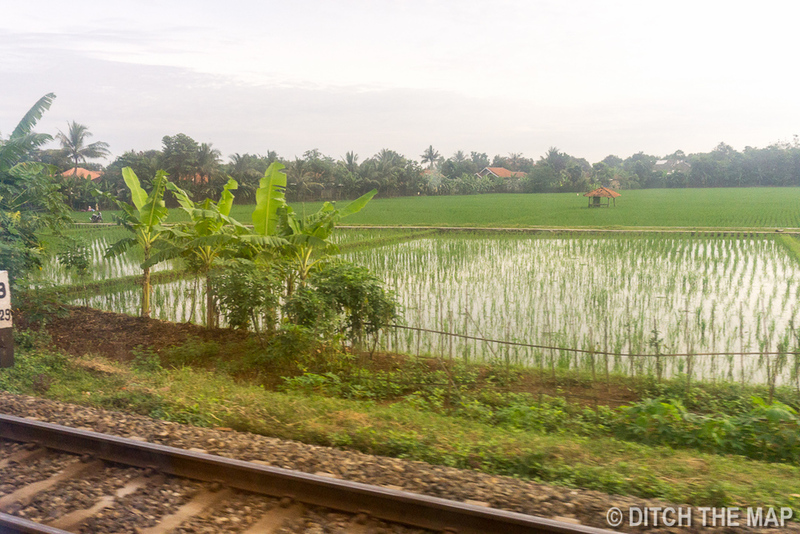 Our 8.5-hour train ride was very different than those in India. People were lined up prior to entering the train station and our tickets were checked prior to entering. There were two professionally dressed women who helped us find our train cabin. The trains and platforms were clean and there was no public defecation in sight...oh how it's nice to be out of India. The trains were outfitted with 2-person benches that did not recline. We struggled to get comfortable and hardly dozed, despite our 6am departure time. We opted for the business-class train, which like the executive class, has air conditioning. The main difference is that the higher class train has reclining seats. Not sure it's worth ~$20 dollars though ($52+ vs. $34). The first thing we noticed about the city was it's lively atmosphere. People were outside enjoying their meals out on the town. There were many swanky and mid-range restaurants scattered up and down the major roads. Warungs, or roadside restaurants, can be found almost every 75 feet. They typically specialize in only a few dishes--but the ones they make are the best around. There were fast food joints, electronic stores, sim card booths, bakeries, grocery and convenient stores, clothing stores, etc. I bought a sim card which provides 4gb of data and is valid for 2 months. I only paid 55k INR ($4.00) and unlike in India I did not need a passport or any other forms. Our dinner only cost $8.50. The presentation and service was spectacular and the food was out of this world. So far Indonesia seems to be much cheaper than India, when controlled by quality. While things can be bought for less in India the quality if all the same, which is to say very low. The only way to get decent quality in India is to pay a large premium since these services are really only used by westerners. 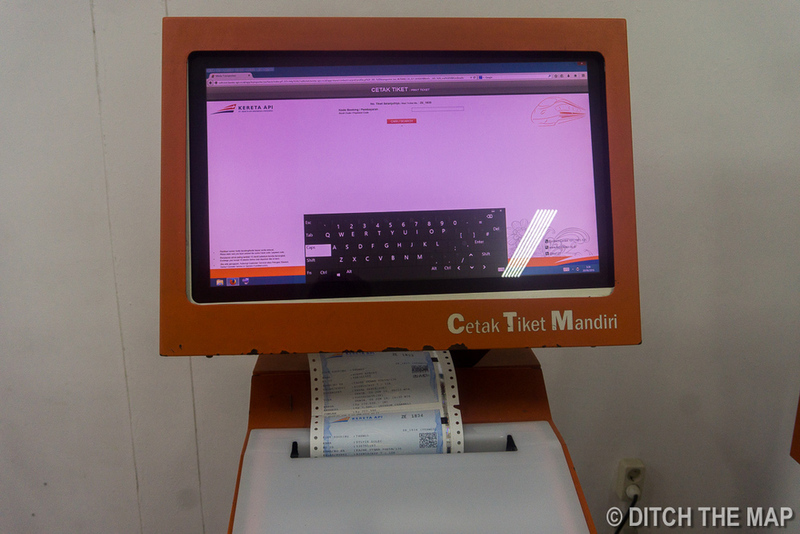 It seems, however, that Indonesians despite their lower incomes, still appreciate quality. We both really enjoyed the bustling city of Yogyakarta. We rode around in style on our rented scooter for 50k IDR ($3.75). Malioboro Street is a large shopping area but neither of us enjoyed it too much. It was just a bunch of shops selling the same junk (tourist trap.) Many shops on Malioboro Street advertise Batik, which is the Indonesian art of wax-resist dyed fabrics. I think they're mostly just printed nowadays though. Next we visited the exotic bird market where many types of birds and other animals were up for sale. We thought the market sounded interesting but we left feeling sad. It was upsetting to see the animals living in poor conditions and small cages. We were powerless to change anything. Using a recommendation from another blog we went to an amazing cafe called Lotus Mio and enjoyed a great cup of joe and locally produced chocolate. Around the cafe we discovered an upscale tourist district with a heavy concentration of white people. The prices were more expensive, though still very affordable ($1.25 for a mochaccino and $2 for a beer). After several hours of trip research over a cold Anker beer we checked out a few tourist agencies before booking a day trip to the Goa Jomblang Caves. For dinner on our second night we went to a local restaurant where we were given menus entirely in Indonesian. We blindly wrote down the name of two dishes. We found the food to be average. Roadside food actually seems better and fresher than the already prepared dishes served at these cafeteria-style joints. For 1,300,000 IDR ($98) we took a trip to the Goa Jomblang caves. The Goa Jumblang cave is part of a system of caves created by the collapse of a sinkhole. Only 25 people are permitted to enter the cave each day in order to preserve it. The agency we booked with provided transport and the drive to the cave took an hour and a half. When we arrived we enjoyed some complimentary coffee and then ditched our flipflops for a pair of rain boots. In our boots we waddled over to the opening of the cave. It was a remarkable sight- a huge sinkhole in the earth, 50 meters in diameter. We stood at the edge admiring the ancient forest hundreds of feet below. Staff members helped us into our harnesses and we lined up at the craters edge waiting for our turn to descend. While waiting we had a chance to talk further with a couple from The Netherlands and a couple from Singapore. We mentioned our upcoming visit to Singapore and they invited us to stay with them. We may just have to take them up on that incredibly kind offer! Two at a time people were lowered down into the sinkhole by ropes attached to their harnesses. We sat back in our harnesses and were lowered together until our feet touched the forest below. 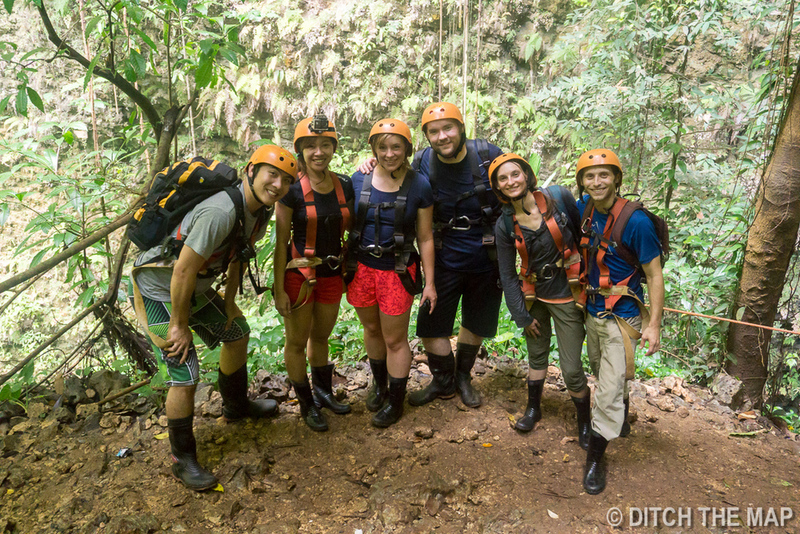 Once the whole group was ready, we headed for the mouth of the cave. We understood pretty quickly why we were provided rain boots as we slipped around in the mud. As we progressed deeper our surroundings went completely dark, luckily we had brought our handy head lights. We followed the sound of rushing water until the cave opened up into huge atrium. Above us ethereal sunlight streamed in through an opening where we could see the trees above us. The only noises in the cave were the dripping of waters drops against eroding limestone. Pretty magical place. Our initial plan for our last morning in Yogyakarta was to see sunrise at Borobudur Temple, the largest Buddhist temple in the world. It's about an hour drive outside of the city and we rented a scooter in preparation. But, when we woke up at 3:45am it was raining. We tried to wait out the rain and left after 5 when it slowed to a few a drops. On the ride there the rain picked up again several times and we were forced to pull over and take cover. Finally, two hours later we arrived a the temple! 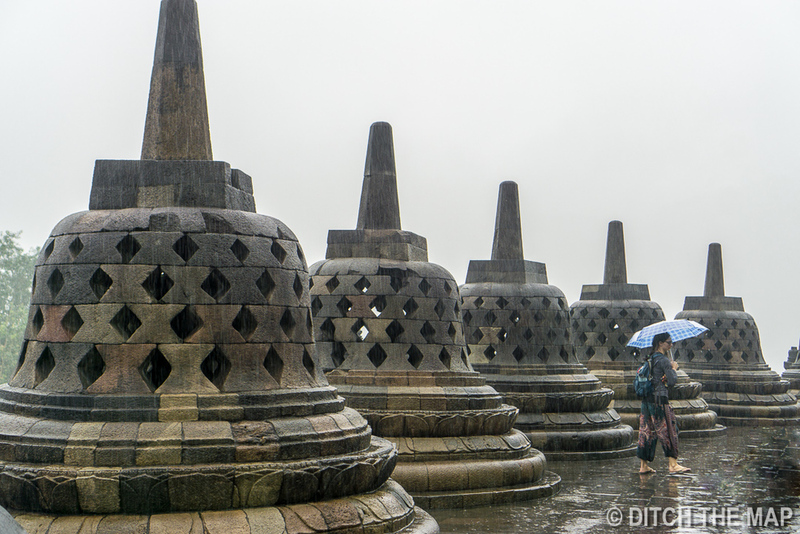 It rained off and on as we explored the temple. We walked through each level of the temple admiring the intricate hand carved stones depicting countless scenes of people and animals. The bottom layers of the stupa were square shaped, and the top three levels were circular. From the top level we could see beautiful hazy mountains in the distance. Too bad for the weather, it really is a spectacular sight. Mount Bromo was on our list of things to see in Java but getting there from Yogyakarta is not an easy feat. 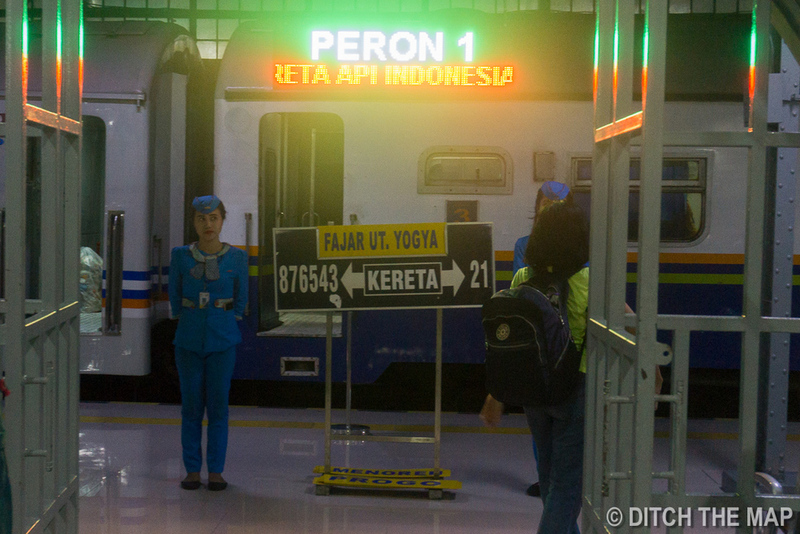 The lack of train options and all too-common scams in Probolinggo were large deterrents for us. However this blog really helped to sum up a major reason we opted against visiting the most tourist-ed active volcano in Indonesia. Basically too many people crowding around a vantage point. It is like our experiences taking the sacred valley day-tour in Cuzco, Peru and the Condor look-out point during our Colca Canyon tour in Arequipa, Peru- crowded, inauthentic, and boring.